Formula Analyzer for Excel (Spreadsheet Auditor) is an Excel add-in which enables to view formulas in a different, more user friendly manner. Formula Analyzer for Excel shows all origin links and/or dependence links which may exist between formulas of a selected range. 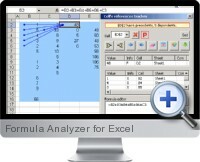 Formula Analyzer for Excel has a unique tool which can analyze, within a specific range, a group of formulas and all the precedence/dependence connections between them. The additional Link Manager tool allows to perform a variety of operations with the external and internal links within a workbook. The Cell Reference Tracker, is a versatile Formula Analyzer for Excel tool allowing to navigate between the cells which originate and/or depend on a cell under observation. This works even through sheets contained in other workbooks. The Decompose Formula tool can determine the origin of each of the cells forming part of a formula, including cells in other sheets, numeric values of the formula; and even cells originating from other workbooks.